Greiz belongs to the German state of Thuringia, a historic German region that became a state after unification in 1994. But at the beginning of the 20th century, it was the capital of Reuss, an old principality that had been in the hands of the same dynasty from 1306 to 1918. The city, which had already been mentioned in writings from the 13th century, is Medieval in origin and preserves a major heritage from that age, such as two castles: the Oberes Schloss Greiz and Unteres Schloss Greiz (Upper and Lower Castles), the Sommerpalais, a Baroque residence, and a large park that is over 300 years old. The city became an important Art Nouveau, or Jugendstil, centre as the result of a fire in 1902 that destroyed buildings in its most central streets. This devastating event also coincided with the consolidation of an industrial middle-class that opted to turn its back on the city's Medieval past and enthusiastically welcomed the new style. 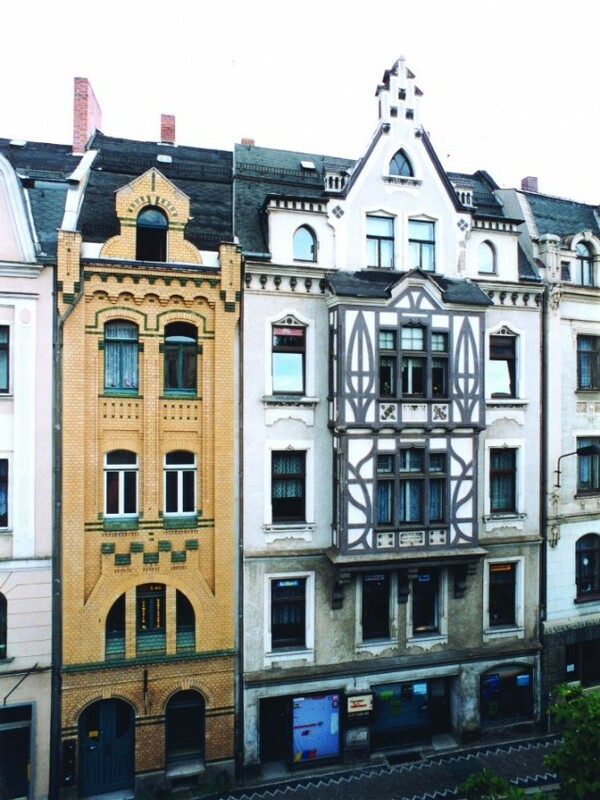 Reconstruction of all the buildings on two of the city's main streets, Marktstrasse and Thomasstrasse, began in 1910. 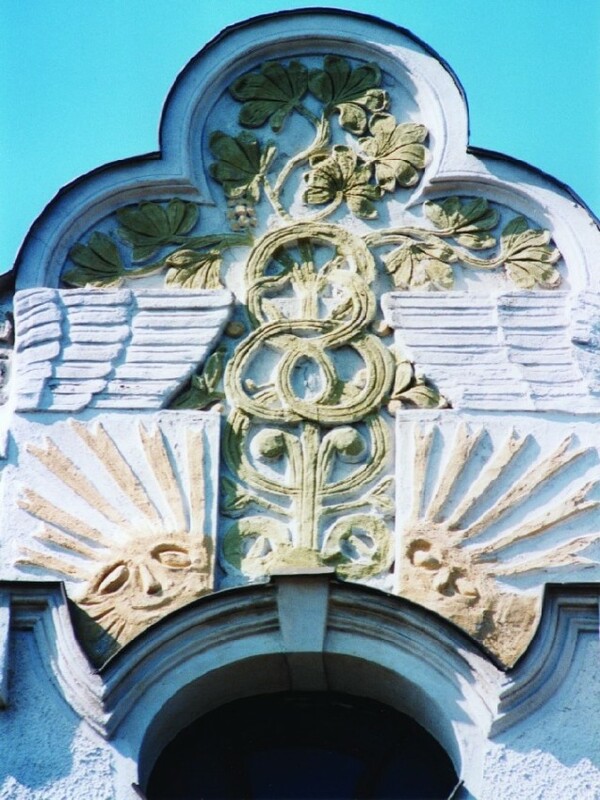 As is common in central European cities, its Art Nouveau architecture is more directly influenced by Jugendstil aesthetics, as can be seen, for example, in the distribution of forms and spaces in walls and the types of masks decorating the pilaster capitals on the façade. 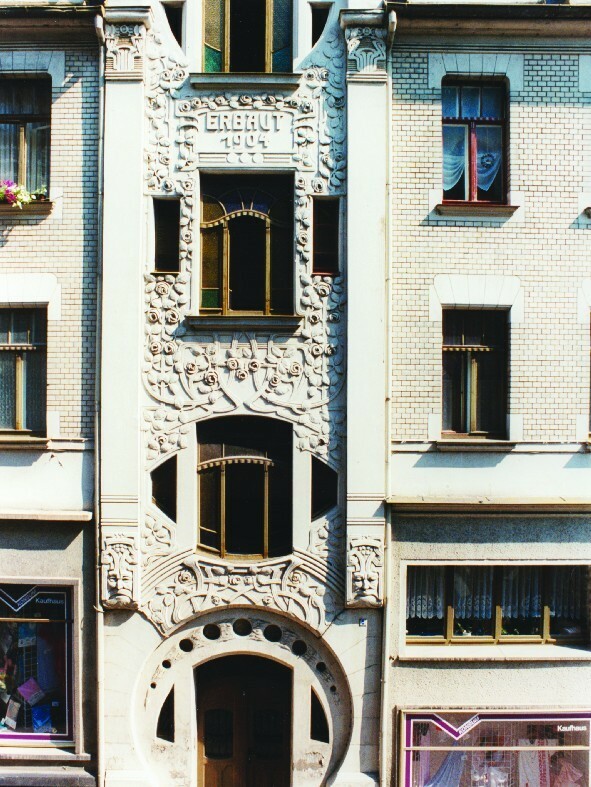 But despite this clear dependency, Art Nouveau tastes can also be found, such as in the large entrance stairway to one of the houses on Burgstrasse dating back to 1904 that is decorated with stylised floral elements. 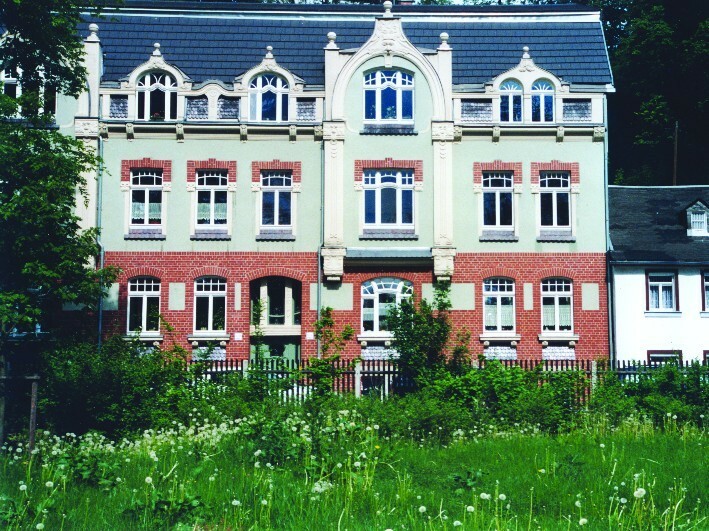 The most outstanding Art Nouveau building in Greiz is the residential block located on the corner of Burgstrasse and Marktstrasse, a large strongly Secessionist building with bright walls highlighted by cleanly designed, cut-out window forms and some elegant galleries. Directly in the middle of the façade, there is an enormous, brightly coloured stained glass mosaic panel showing a goldsmith working dressed in a traditional Medieval outfit, a clear allusion to the owner's profession. It is also worth mentioning the Tunnelwappen (Coat of Arms Tunnel) on Thomasstrasse, which received its name because it was the direct entrance to the market in earlier times. Its most prominent element is the figurehead on the façade's gallery: an original caricature bust.